William Borucki, a space scientist at NASA’s Ames Research Center and the principal investigator of the agency’s planet-hunting Kepler mission, retired from NASA on Friday, July 3, after decades of a successful career. His 53-year scientific lifework, marked with numerous discoveries and prestigious awards, is best known for his persistent advocacy for an exoplanet searching satellite and then leading the Kepler mission to outstanding successes. Born in Chicago in 1939, Borucki grew up in a small town in Wisconsin where he liked to build and launch model rockets. He studied physics at the University of Wisconsin, Madison, earning a master’s degree on the subject in 1962. Afterward, he applied for a job at NASA. According to Borucki, the Space Agency was the only place that he had considered. Borucki first worked on the development of the heat shield for the Apollo missions in the Hypersonic Free Flight Branch at NASA Ames. During the period from 1962 through 1972, he conducted analytical lab studies on the radiation environment of entry vehicles. After the conclusion of Project Apollo in 1972, he joined the Theoretical Studies Branch and developed photochemical models of the Earth’s stratosphere and mesosphere to investigate the impact of nitric oxide and fluorocarbon emissions on ozone. He published numerous papers on how ozone would be affected by nitrogen oxides. “We didn’t predict a hole in the ozone layer, but we did predict that the decrease would be seen first at the poles,” Borucki said. It took five proposals spanning more than a decade for Borucki and his colleagues to prove the efficacy of this method for discovering Earth-size planets around Sun-like stars. 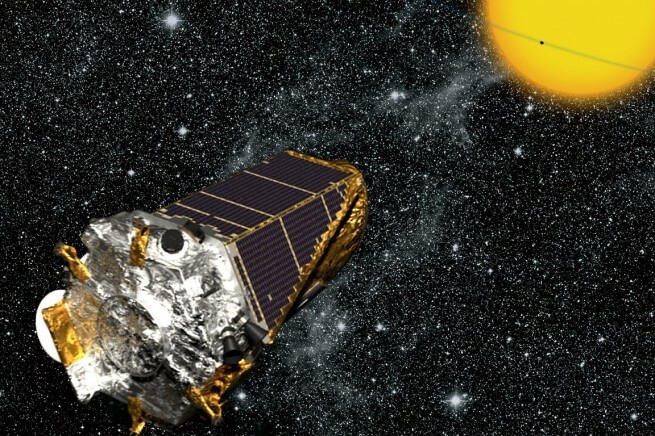 The Kepler mission was finally given the green light in 2000. Borucki became the principal investigator for the Kepler Space Telescope, which was launched in 2009. As of July 2015, Kepler and its follow-up observations have found 1,028 confirmed exoplanets in about 440 stellar systems, along with a further 4,661 unconfirmed planet candidates. 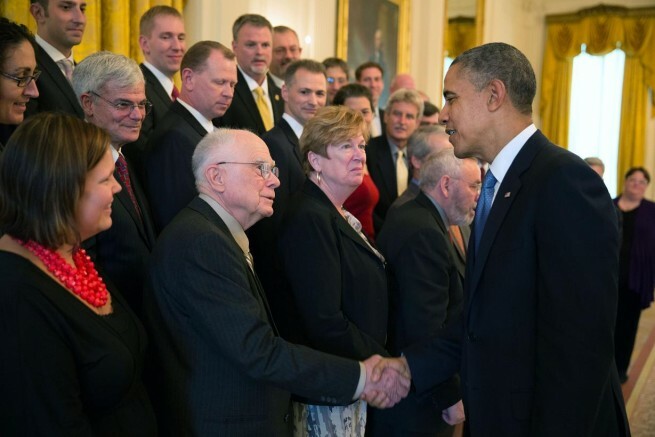 President Barack Obama congratulates William Borucki on being a finalist for the Samuel J. Heyman Service to America Medal in the East Room of the White House, Oct. 23, 2013. In recent years, Borucki’s life has been dominated by the Kepler Mission. Acknowledging Kepler’s achievements, Borucki was recently awarded the esteemed Shaw Prize in Astronomy 2015 for conceiving and leading the Kepler mission. For his work, he has also received the NASA Outstanding Leadership Award, the Popular Mechanics Breakthrough Award in 2009, the NASA Systems Engineering Excellence Award in 2010, and the Lancelot M. Berkeley Prize for Meritorious Work in Astronomy in 2011. In 2013, he received the Henry Draper Medal from the United States National Academy of Sciences and Samuel J. Heyman Service to America Medal presented to him by the U.S. President Barack Obama. Borucki is well recognized for his groundbreaking concept, as well as his leadership during the development of the Kepler Space Telescope. 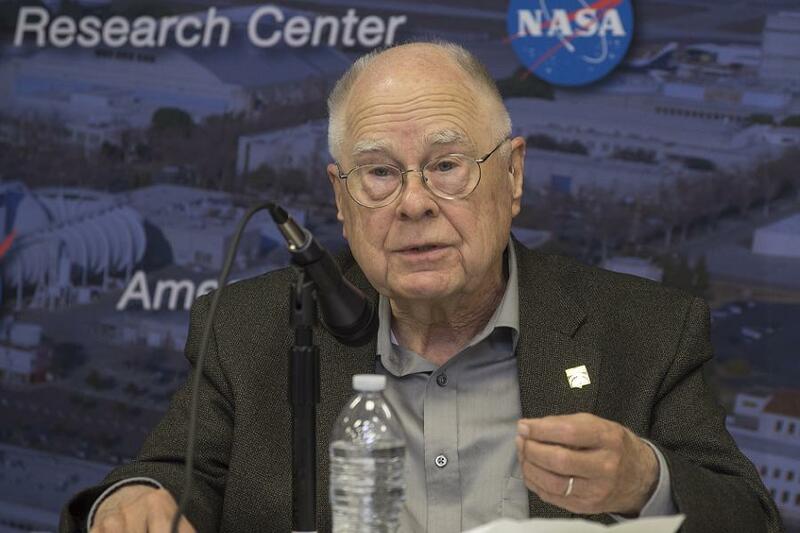 After his retirement, Borucki will rejoin the NASA family in August as a volunteer Ames Associate where he will continue studying exoplanets and planetary system formation. 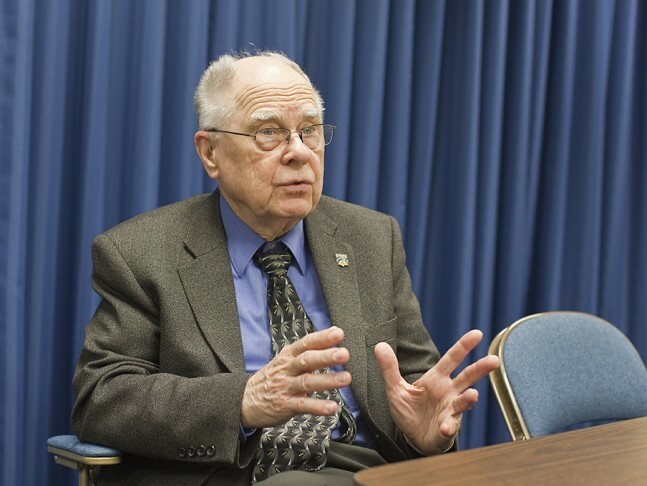 For Borucki, his time with NASA was well spent, but the agency is in good hands. “The children are the people who will determine the next steps,” Borucki said.